“Teliani Valley” winery situated in Telavi, Kakheti, the region of Georgia richest with wine, offers various types of wine tours all year round. Teliani Valley winery tour lasts for an hour. During the tour, you can learn about the history of Georgian wine and the winemaking process, have a look at the receiving, pressing and cooling units of the winery and check out the bottling process too. At “Teliani Valley” oenotheque, you will get a chance to learn about the ancient traditions of winemaking and taste the wines from some of the best vintages. Rtveli is the celebration of harvest, fertility and prosperity. In winemaking, Rtveli is the main event of the year. Our employees take the preparations very seriously, arranging the traditional vessels for grape picking called Godoris, weaving the new ones and restoring the old ones. The harvesting of grapes begins roughly at the same time everywhere, and it lasts from dawn to late evening, accompanied by singing, music and all kinds of festivities. Once picked, the grapes are pressed by foot, in accordance with an ancient Georgian custom. After the grapes have been picked and pressed, it’s time for “Zaotoba”, or the distillation of Chacha. In the meantime, the meat is barbequed, the bread is baked, and for dessert, Kakhetian bebos dip nuts into Tatara to make Churchkhela, involving the guests and giving them some fresh, warm Churchkhelas to take home. The visitors are welcome to partake in every part of Rtveli. A small, guest house type hotel located at the entrance of Telavi, on the premises of ”Teliani Valley” winery, has been hosting wine lovers from around the world since 2005. The guest house offers 7 rooms in total, 5 standard and 2 luxe. Each room is named after a famous Georgian wine - the guests can choose to stay at Teliani, Mukuzani, Qvevri, Tsolikouri, Saperavi, Tsinandali, Khvanchkara. All rooms are decorated in classical Georgian style, each according to the color of the wine it is named after. Besides from a filling breakfast included in the room service, visitors can also experience the authentic Kakhetian Supra, along with a wide variety of “Teliani Valley” wines. Our specialty wine shop is located in Telavi, on the premises of “Teliani Valley” wine factory. Here, you can purchase a full range of “Teliani Valley” wines. 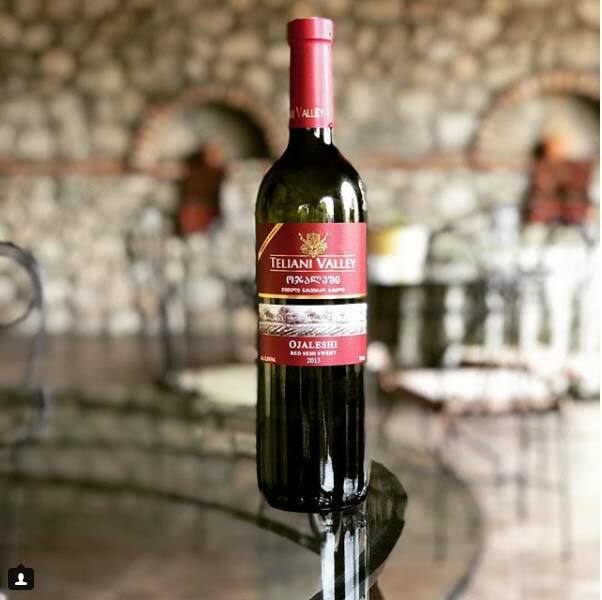 “Teliani Valley” winery visitors have a chance to savor a range of our wines. Our professional sommelier will talk the guests through the rules and etiquette for wine tasting - a choice of glass and how much to pour, temperature recommendations for various types of wines, wine color and opacity, determining wine age and origin, recognizing tones, tastes and aromas and more. It is not recommended to taste wines after eating or consuming strong spirits.